There is simply no better welcome to your backyard than a yard gnome. According to legend, gnomes come alive at night to tend to and protect your garden. As far as we’re concerned, they’re too adorable to pass up. Our yard gnome styles include the traditional red-capped standing gnome and other more unique statues to complement your style. For a fun and unexpected gnome design, try our 18-inch bobblehead watering, gardening and rabbit gnomes. These gnomes have a high-quality flexible steel spring allowing its head to bobble with a little tap to the beard or a gust of wind. Our watering bobblehead gnome will become a living part of your garden, with its realistic features and moving head making your gnome look more lifelike than ever. While most gnomes are focused on their gardening chores, our rabbit gnome is enjoying the sunshine and playing with a cute bunny. 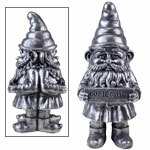 One of our favorite designs is our three gnome statuary. This endearing figure has three stacked garden gnomes showing their playful side. Add this lighthearted 21-inch high statue to your garden or patio for some summertime cheer. 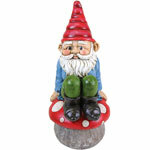 Our three-gnome figure is a crowd-pleaser that can live inside or outside to add to your decor. 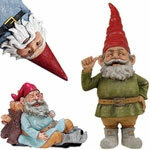 Visitors of all ages will love these lively gnomes. GardenFun’s selection of yard gnomes is constantly growing. Our yard gnomes are explorers and readers, with one style doubling as a bird feeder. Place a reading gnome in your yard’s quiet space where you love to settle in and read your favorite books, or choose a laughing gnome to add to your child’s play area. Our gnome explorer and bird is the quintessential gnome style, with a red cap and blue top that every gnome enthusiast needs. 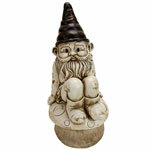 Find masculine Woodland gnomes, too, to enhance your gnome collection and your landscaping decor.